The course is dedicated to categorization of aircraft. All possible categories of aircraft flying up to date are been discussed starting from their history and brief information about most known representatives of each category is given. All of the persons, having passed the course, will know the basic principles of categorization of aircraft, know the categories of aircraft, distinguish the belonging of some different aircraft to different categories, know some facts from the history of aircraft and also some basic technical data of some aircraft. The course is presented in a form of full E-aid, containing 11 different lessons. For each lesson (video lectures, about 30 minutes per video)), an additional brief written form content of the particular lesson is given, as well as a glossary and a 10-question multiple choice test is proposed at the end of each lesson. A very well structured course of presentation and classification of aircraft, including lot of videos, pictures and links. 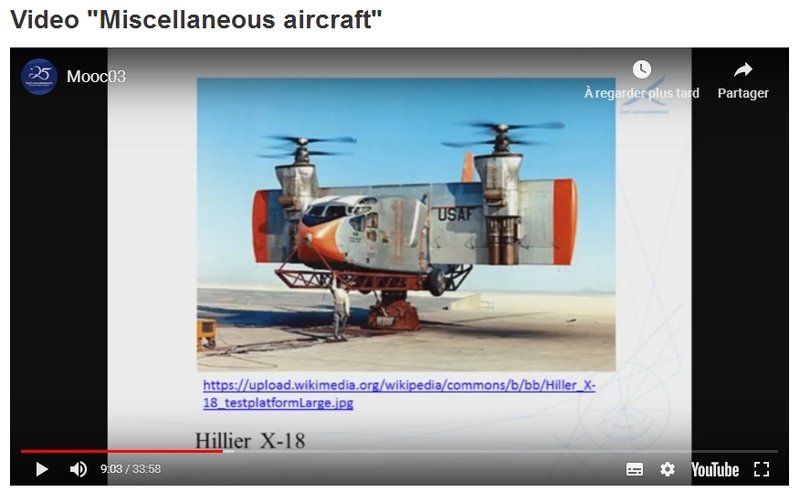 I really enjoyed this introduction Mooc, easily accessible for beginners, but also including useful information for those who are already familiar with aircraft (for instance infos about VTOl Jets, tiltwing aircraft,…). One of the few Moocs, where the required time-investment isn’t too important and corresponds to reality (26 academic hours, with the optional possibility to get more information via the provided links and personal researches). For each test you have two attempts, personal score was 95%, based on one single attempt.